After a wonderful 3 week break in print, we are back, and doing what we do better than anyone: giving a voice to those in Lakewood, online and in print, who would not normally be trusted by the "corporate" media to speak, write, post, or share with an entire community their ideas, thoughts and views of what is going on in this city and region. We are completely 100% Lakewood, with Lakewood owners, management-- even the code to our software was written in its entirety by Lakewoodites. It was through the insight and vision of some of Lakewood's finest and most infamous leaders that this project came to fruition, and it is that guidance and management that allows it to continue to grow and evolve into one of the best community packages in the world today. While we were off, we were not sleeping, we have added 5 new media projects in other cities, counties and states,and were recently heralded as, "One of the most innovative community development projects in America." What does this mean to Lakewood? 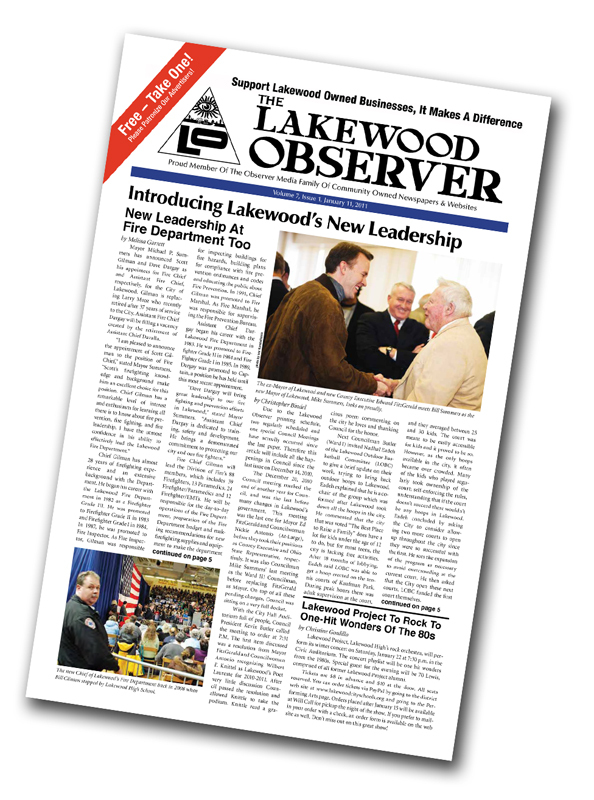 It means increased stability and sustainability in the Lakewood Observer. because of that same need in other communities that we grow into new areas that are ready to be trusted to take ownership of their own words, ideas, and actions in a forum that rewards openness and honesty as the best way to move a community-- businesses, education, government and life in general-- forward. All of this has been made possible because of the help and participation of Lakewood's residents and businesses, city and civic leaders who have stepped up and shared their ideas and thoughts in an open and honest way. We hope 2011 will see Lakewoodites and our leaders continue to move into the light of open discussion, open media, and open actions that will allow the partnerships of all to grow to levels that have been unthinkable in the past. After all it is 2011, isn't it time we trusted and worked together for the betterment of Lakewood? Thank you, Lakewood, you are marvelous.